When I was placing furniture here in the kitchen sitting area I knew I wanted it to have the "feel" of my previous sunporch. The old sunporch was full of vintage pieces, each of them with aged and chippy white paint. Anything vintage felt at home out there, and it was one of my favorite places to decorate and photograph. An old white paneled wood door that was angled in the corner sort of grounded the settee, and gave me a place for a mirror and seasonal wreath. I have sold so many of my favorite white chippy pieces, but I saved the door and wanted to use it again, and so after a week of searching the storage units, I found it in the back corner with my white metal gate and gray shutters. (Hmmmm...was Hubbs subconsciously hoping I'd forget about them?) That wasn't going to happen. Anyway, the new sitting room felt off balance and odd with that corner hanging out all bare behind the wicker settee. I just had to try that door. We brought it in to the kitchen and for a moment the "new" of the new house tried to tell me that it was too chippy and banged up and that it's old hinges would damage the walls and that it would scratch the hardwood floor. The "new" house said "it will look out of place and everyone will think you're nuts for having some old crummy door in your kitchen". But once it was in place, I knew it was back home where it should be. Now my settee has it's old partner again, and I can sit here and enjoy a cup of tea in the afternoon, or read through a magazine while dinner is on the stove. My quilts, coverlets, plaid blankets, and pillows all have their old spot back. 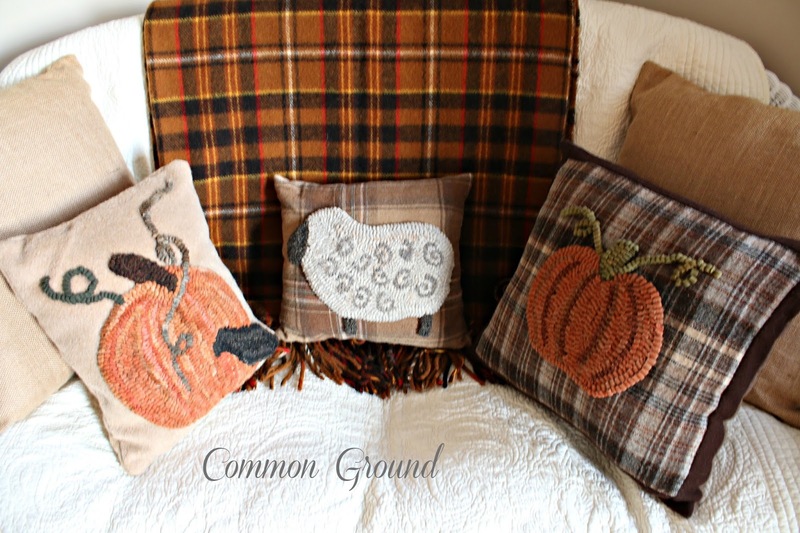 Just a little more time to enjoy the hooked pillows and warm Fall blankets. And then it will be Christmas time, and I'll get to change it all up again. I'm learning that there can be a balance of the things we love. That living with and decorating with "vintage" things is my first love. Capturing a feeling or essence of what makes a home comfortable, enjoyed, and reminiscent of our past is what's more important to me. I've realized this last year how much I've missed documenting the Seasons and Holidays the way I used to. While I admire all the bloggers that can give you 6 ways to do this, or 5 ways to do that, I know that that's not the real me. Finding the right light to show a flame of a candle, a delicate flower of a paperwhite, or an old religious print, is what I'm more about. Oh, I'll always have a project to share, a painted something or other, and my latest decor idea, but this last year having had most of my things packed away, I've learned where my heart really is in blogging... and that's right where I started. Be yourself, and blog about what you love. Don't cave to the pressure to turn yourself into something you're not comfortable with. Take a rest and find your joy in life. It will show. Wonderful post - I love the old door and it looks terrific where you placed it. I agree with you about posting. I don't post a lot, but hopefully it's about something I love and think my followers will appreciate. I know you are happy to get all your lovely chippy things in order. That door is perfect there...I'm glad you didn't listen when the new house was telling you it was too chippy! Also loving the pillows, especially the sheep one! I always enjoy your blog, even though I don't always comment...I ALWAYS love what you've posted, but sometimes my fingers are too lazy to type the comment! I'm going to try to do more of that. As a fellow blogger, I know that comments matter. Love,love the sheep. But as much as I love sheep, the message of your post was just what I needed...a comfort to this part time blogger who is trying very hard to remember that blogging is an individual adventure and I'm most happy when I do it my way. Thanks Debra! I totally agree. I'm only blogging about the things I love to do. I also only blog when I really want too. I'm so happy you are feeling well. It's been Sooooo Long since I've visited your site!!! The DOOR is just perfect in that spot... LoVe the Frame as well... Some things just make us HaPPy!*!*! Beautiful said, darlin - and that looks totally awesome right there, as it should be. Yay. Well said, Debra!! I was thinking this very thing as I was painting my old wall cupboard today. You have to do what makes YOU happy and when you blog about it, your passion will come to life in your post. You've carved out a cozy little spot to enjoy your treasures from the past. Enjoy! The door looks great there, Debra! Very wise words and something that I have been doing over the past couple of months myself - thinking. Finding the balance of blogging is a struggle. I've done things that I think will get attention and eventually I don't like it. I love your chippy door. 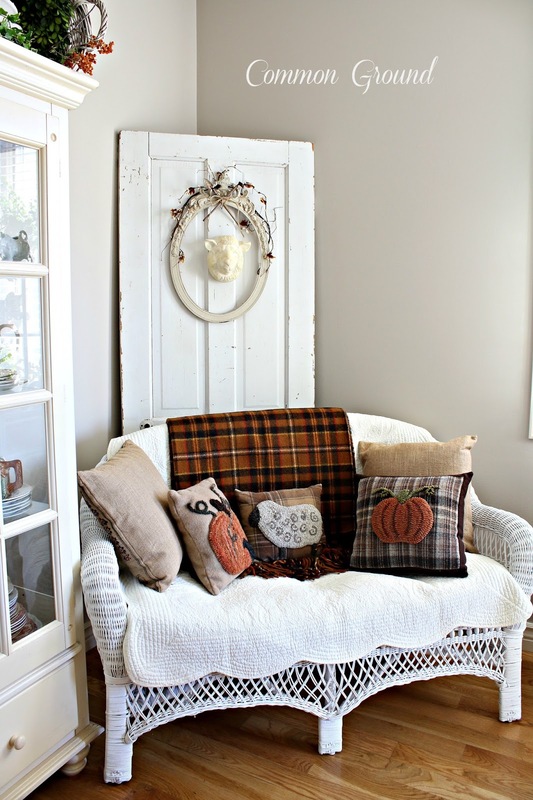 Your sunroom photos were what drew me to your blog. I'm glad that you have a place to put your vintage, sunroom favorites. I can't wait to see your bakers rack changed out for the seasons again. It looks awesome and belongs right where you have it. Glad you did not listen to the house and went with your gut good choice!!! Have a wonderful week. Debra, I've always loved your style and I admire you for being true to your style. I agree with you that we should blog about the things we love....I wouldn't be happy if I didn't. Guess that's what makes us all so unique. Keep doing what you are doing because the true you always shines through. 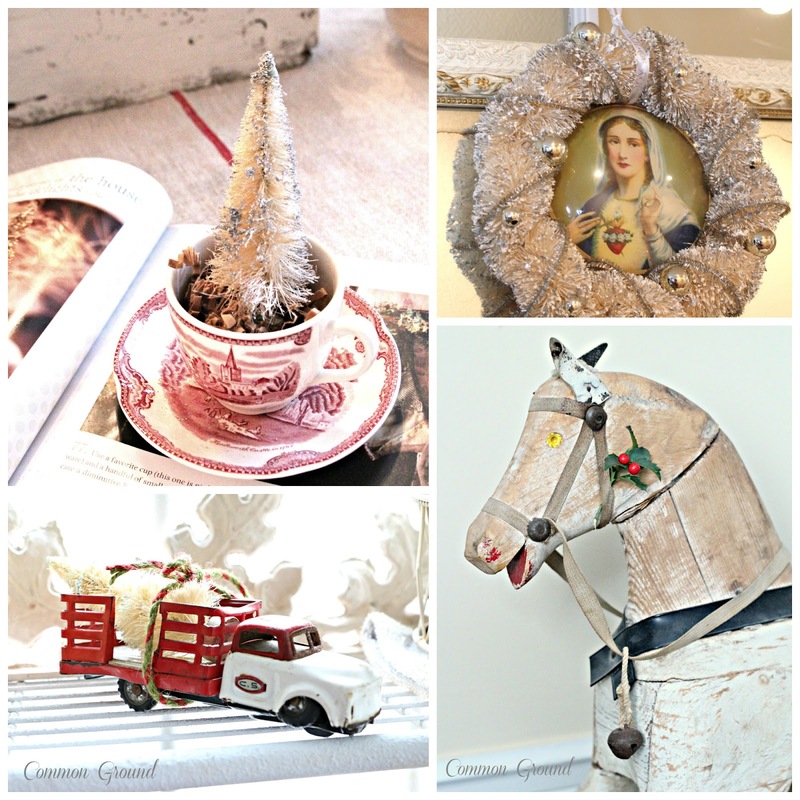 Lovely decor and lovely post! It's always good to be reminded to follow our hearts. Thank you for sharing. Oops, I meant 'vignetters' in my last comment. either way, it's not a word! We were all created unique and so are our blogs. I loved your comment about blogging. I have a full life apart from blogging and I want to enjoy blogging not let it own me. I can't tell you how nice it is to hear your reflection on blogging. It aligns so much with how I feel. My blog is to help my long-distance Panoply sister have a way to stay in touch with what we do in our antique booth spaces, and, naturally, how we sisters shop extends into our homes and gardens with what we buy and love. I love sharing the finds, deciding on fostering, adopting or selling, and the exchanges with others who have similar interests. I enjoy seeing other bloggers' creativity, but my natural me is not inclined to craft each week. I love how you're getting into your groove again, and love seeing you pull your treasures out again. Great post...wonderfully said about being true to ourselves. Love the old white door!! Love your heart Debra...and of course your cold paneled door and vintage frame too! The door was meant to be Debra. After almost four months our home is still on the market and many of our things are in storage and they may well be there a year. With J's surgery last week and a couple of other things going on, the less is more idea is very evident here at our home. When we got the surgery news, we decided to give up the rental and come home for Winter.Who knows...we may just stay here and adapt. :-) Priorities...in blogging and life...a good thing. That's a great message Debra. I love that you have a good sense of "self" and who you are. Its reflective in your blog style and the reason we love following you and seeing your creations! Beautiful post, Debra, and exactly what I needed to hear today! Thank you! I love the old chippy door. I am glad you convinced your hubby to let you put it up. The sheep is charming. I'd like to see him there for a few seasons. The corner look so cozy now. I so agree Debra, blog about what you love! 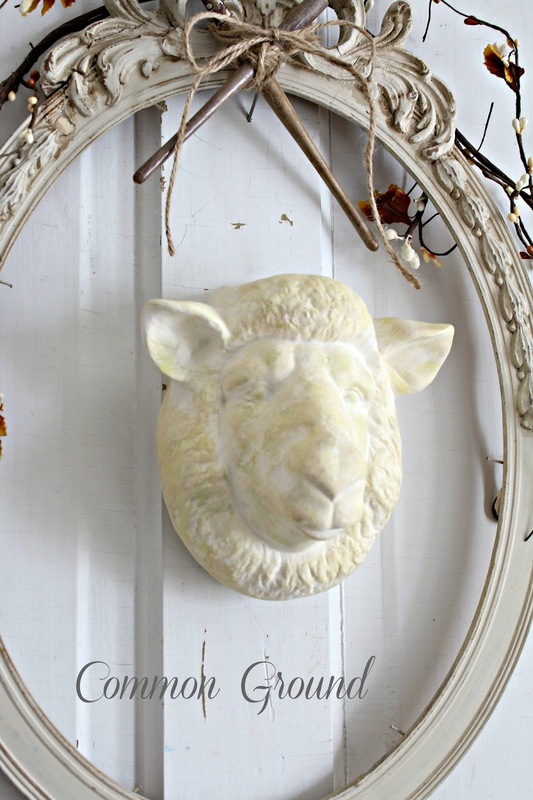 And I love your chippy door with the mirror and sheep's head; very cute! Beautiful post...and door! 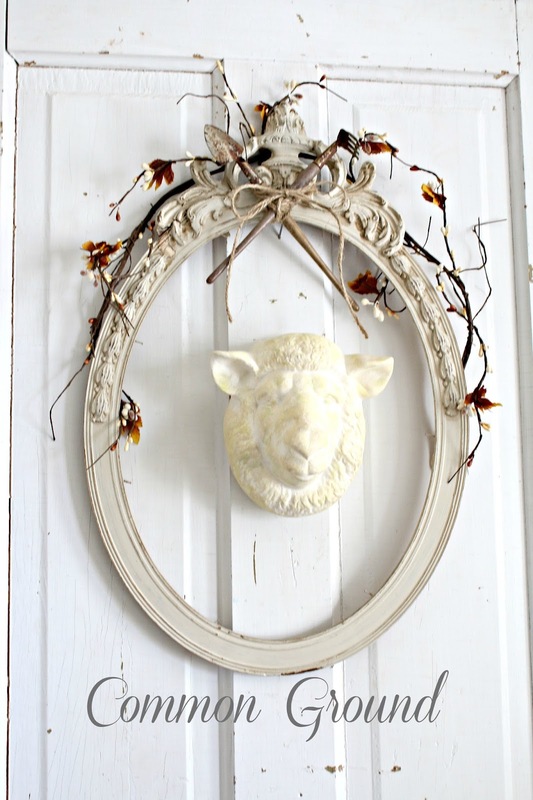 I just picked up one with a beautiful oval window that I want in my bedroom and hope to share it on my blog soon! Looks like things are falling into place. Lovely pictures. Well said Debra!...the door looks great behind the settee and glad that you feel comfortable and cozy in that space that you love...I have always looked forward to your seasonal decor that is always so beautiful! Oh Debra what a beautiful post and you are so right about blogging. I fell a little into the trap of making sure I had published so many post per week that the fun began to slip away. Then over the summer I was really busy with the kids and I was forced to slow down. Now I am getting back to enjoying the true spirit of why I started blogging, and it is fun again. And your door...OMGosh I love it in the corner of the room...chips and all. 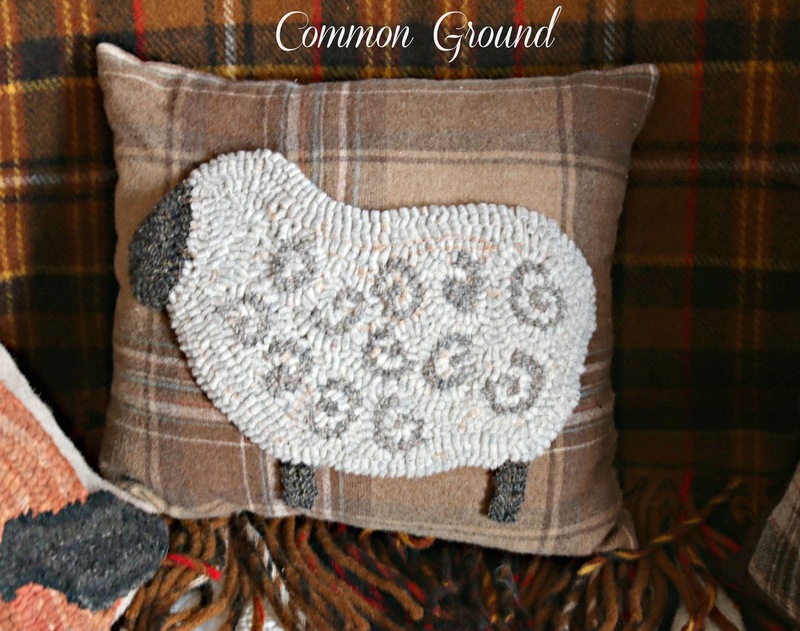 You really know how to create that warm cozy feeling in a home, what a gift you have! As usual you speak to my heart Debra. I actually stepped away from blogging this month to slow down and focus on nesting at my own pace. I was feeling pressured to keep up posts and it started to gnaw at me, I got so many kind comments when I wrote a post about this feeling and it really helped. We can only be who we are. And this is what we can bring to our blog. Whatever you do, keep being yourself, it's beautiful. Well said, my friend! Well said. Bravo on your written post. . .and placement of your chippy vintage door, dear friend!!! I agree, when blogging ( or anything in life) be 'true' to yourself. My followers and friends enjoy my Tutorials. I try to do one each month, just for them!!! for ideas each Season with their home decor. Through my blog, we all stay connected!!! 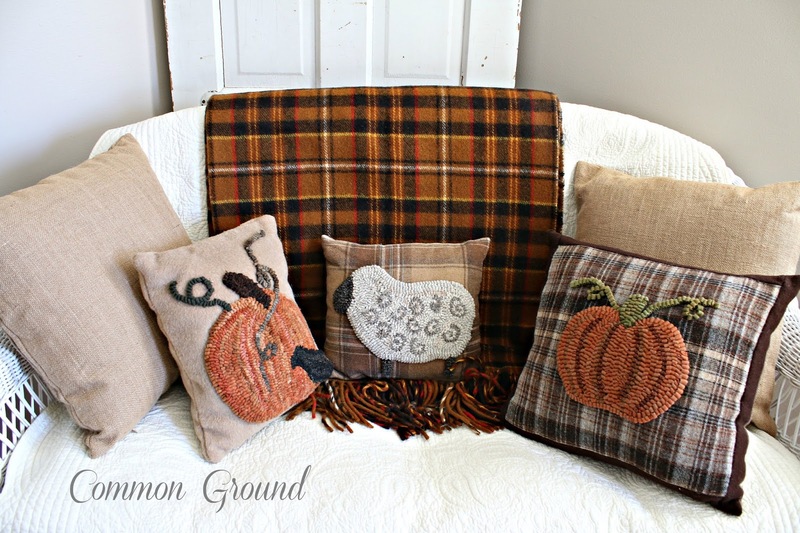 I enjoyed seeing your Autumnal decor and pillows!!! I'll be watching for glimpses of Christmas on Common Ground! 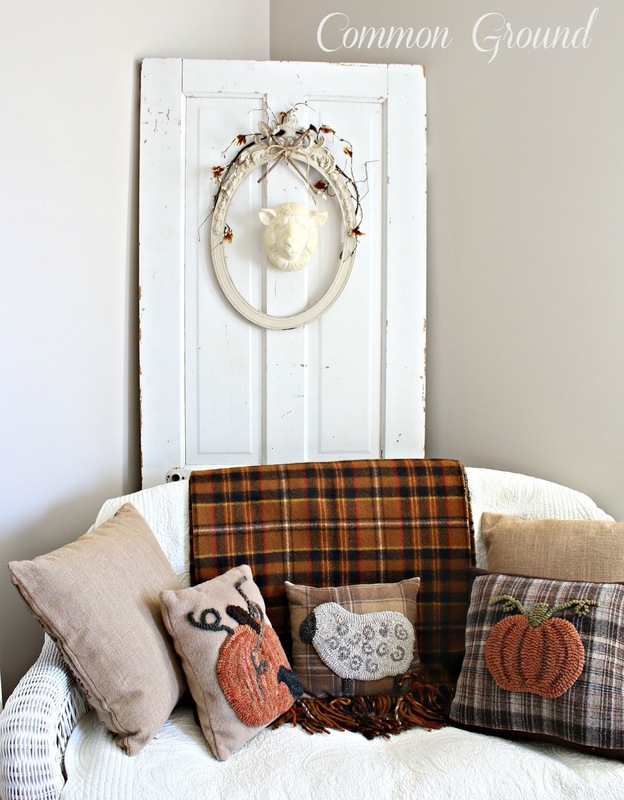 Such a lovely worded post and decorating too! I am also really liking all the chippy doors that everyone has been decorating with these days...thank you for the inspiration! So lovely to see your new house find itself! I simply love this cozy little corner. So warm and inviting. I really enjoyed your thoughts here. Debra, your old door definitely looks right at home! I totally understand what you are saying about the new home. When we moved in here I thought that my vintage items just wouldn't work. I lived without them for a while, but it was just not me. I've added probably a lot more than hubby would have liked, but it made it feel like home, not just some place I was visiting! I agree, be yourself. That's what makes blogging so fun!